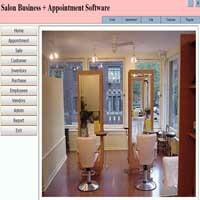 Repair Store/ Shop / Business Software for Non Automotive. Repair Store Expert POS Software 2018. 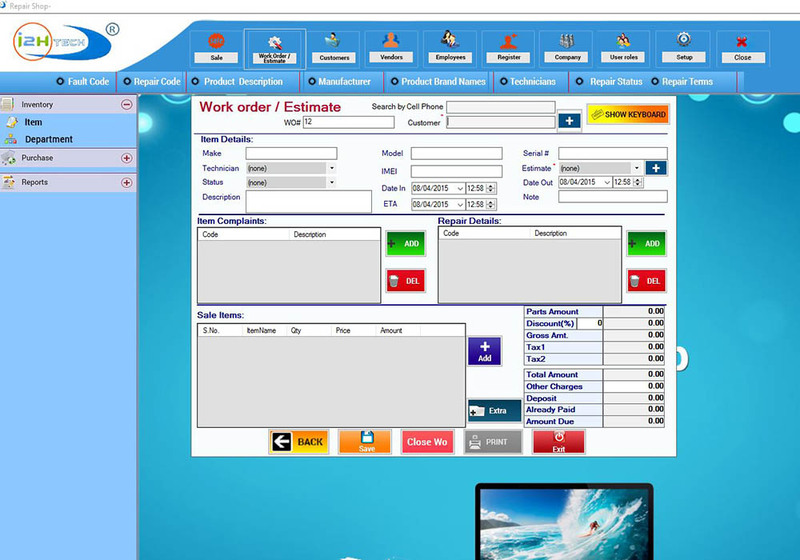 Repair Shop Expert POS Software. Phone / Computer Store Repair Software with POS Sale. We provide Instant Download Link for Local and International Buyer. Repair Store Expert Software is a Feature Rich Software for Repair Business Store , Phone Repair , PC Repair Store , Electronics / Game Repair Store and other Repair Stores. View Screen shots of repair store Software is action. 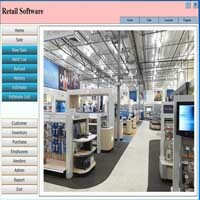 Feature Rich Repair Store software for Computer Repair / Mobile Phone Repair / Electronics and other Repair shops. Secure Login : You can Login with User ID and Password WITH i2htech / Bizsoftexpert Repair Store software. Send WO / Sale Receipt by email to Customer, Remind Old customer , who have not Come for Repair in Last 90 Days ! 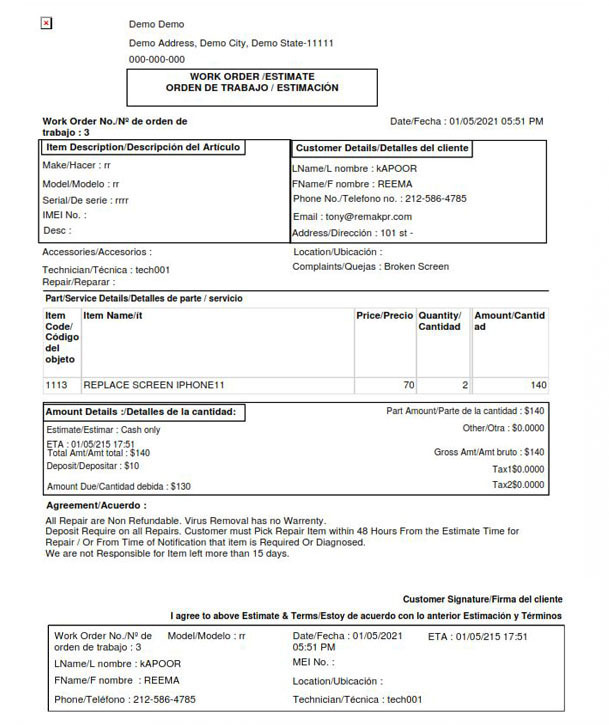 Below is the picture of a New WORK ORDER & Print work order / Receipt . Best Repair Store Software in USA and Canada . Can you used world wide ! Create work order for Repair . Here is the sample of work order. Generate Work Order for Repair . Here is sample of work order below. Enter some Basic Details, Information about Complaint and provide, Estimated Repair Cost . Print the work order and get it signed by Customer. Print Out : Work order can be Printed. Here is the sample of work order. Adding Services / Parts / Products. 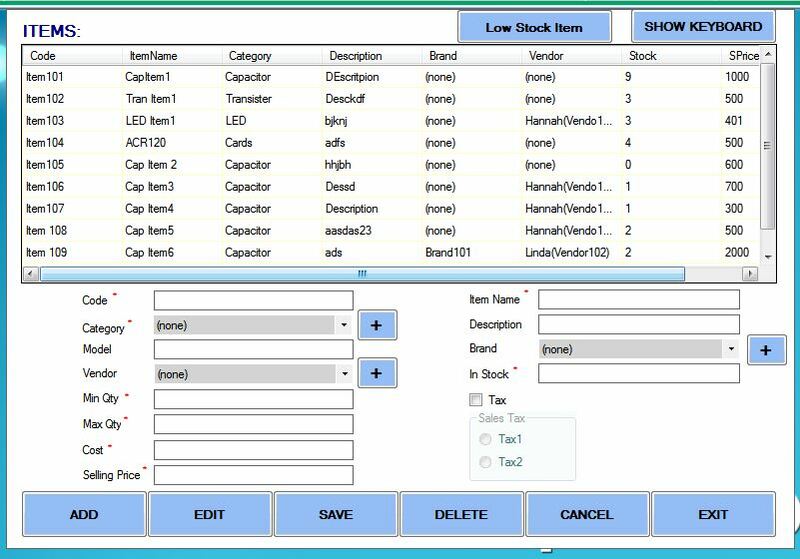 Inventory adding: Items / Parts can be easily added , Add Departments and then add Items / Parts and Services for Repair or Sale with point of sale Module . Easy to use Repair Store Expert software. You can manage inventory by adding Parts, Products, & services. Example computer Diagnosis is a service , you can create an Items = Diagnosis, and you Charge $x for Diagnosis. POS Sale : Sell Items / products without Repair or work order, with point of sale Module . Comfortably Run your Business Efficiently.. Select Items with touch screen . Easy to use. 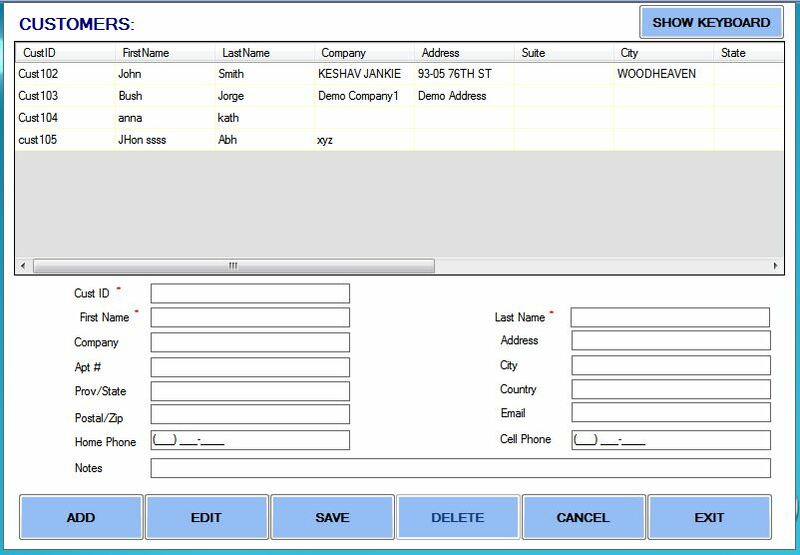 Sell Products / Items / Parts using Point of sale Module, Without Creating Work Order, when a customer comes in store to shop Products only. Sample Work Order & Receipt. All Transactions and operations are saved ,See below a Sample Work order Print out and Receipt, with your OWN Company Logo. .This is easy to use software for Repair Store. Sell your Product / Items , Retail POS module. Based upon years of Experience in Repair Store Environment , We have Created professional "Work Order and Receipt" Print Out, with Store message, terms / conditions and disclaimer notice. There are Company info , Company Logo, Item details , Customer detail & Date, on Work Order and Receipt. Below is a Work Order print out . A section of this can be "Tear Out" and attached or "Stick on" Repair Item. Work order is created at the Time of DROP off. and /or when Customer come in For ESTIMATES. When Customer "Pick Up" Repaired Item a Receipt is Printed on 3" Printer / POS printer. For Repair Work First "Work Order" is Printed as Above and Finally, at the time of "Pick Up" a Receipt is printed as below. Database Backup and Restore : For Repair Store Expert software you can easily secure and control Database. There is "Sample Data" for Practice and to get familiar with software, You can Click on "CLEAR DATABASE" and it will be removed from Database. You can write Agreement for your Business, You can Back up / Restore and Clear Database(Below ). As a safe Practice "Backup" you data on regular basis. Setup Software for productivity & accuracy. Setup:: Easily Setup Tax , Company, Fault Code, Technician , Printer, Message on Receipt, Disclaimer Note. & Logo. Company Info: This information will be Added by Registration / Activation and can not be changed. And this will be Printed on Work Order and Receipt. To change Tax for your State / Province or County; Change the Value and lick on "UPDATE" button on right . Install Printer in Window 7 or 10 and Select POS Printer and Report Printer, within i2htech Repair Store Expert Software, as shown below. Print out Receipt on POS printer. We recommend star TSP 100 or PBM POS printer , Contact us for more information about Compatible printers and Low Rate Printers . Reports: Heart line of Repair Business. Reports: You can view and print Various Report on Sale , Work Order , Items , Repair Code , Customer & Other Modules . Reports are printed on letter size printer. Select a Reports from Menu on Left Side. All reports can be view / print by "Range of Date" , by starting and ending date. We recommend Star TSP 100 Thermal Printer and PBM thermal printer for Repair Store POS Receipt. Easily add All your Departments and Items. You can setup Software in few minutes and start using it . Add Service and Diagnosis Charges..
Keep Track of close and open work order. Recommended Hardware : We sell POS Printers / All in one Touch sceenn Contact us. REPAIR SHOP / STORE SOFTWARE FEATURE. ADD SERVICES / ITEMS EASILY. WORK ORDER / ESTIMATES . FREQENTLY ASKED QUESTION. Q: What kind of OS Needed?. A: Windows 7 or 10 Q:Will it work on MAC / Android. A: No Q: What kind of Receipt will be Printed?. A: 3" on POS Printer. Q:Is it Networkable?. A: Yes. Q: Will this software work in UK / Canada?. A: Yes. 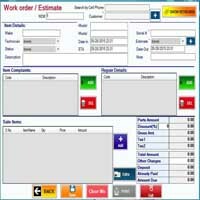 Q: Can this software be used to Provide Estimates?. A: Yes Q: Can you use Touch screen POS?. A: Yes. Q: Can you provide Download link? A: Yes. Q: Does this have email Reminder Feature? A: Yes. Q: Does this have "Sale Only" POS module? A: Yes. Q: Does this have "Item Location" feature to find repaired Item? A: Yes. Q: Does this Software Create "Work Order"? A: Yes. Q: What is "Print out" size of "Work Order"? A: It is 8.5x11". Q: Can this software be used On "Local Network", and used on More than one Computer? ? A: Yes. Please Contact us to buy license for "Per Seat". Experience the Power of POS software, Repair Store Expert Software is the best easy way to manage your Repair Business.